After finishing the 2013 season with an 11-4-3 record and missing the NCAA playoffs, the Armstrong State Pirates soccer team are raring to get the new season underway. The Pirates were picked to finish third in the Peach Belt conference behind Clayton State and Columbus State in the annual coaches’ poll. The Pirates have been working all summer long to try to get back in the playoffs and hopefully bring home their fourth PBC Championship. Junior goalkeeper and 2013 All-Southeast Region honoree Morgan Luckie thought the preseason was great and is excited to get the regular season started. The team has big goals set for themselves this year and senior Brianne Matarazzo has set the bar high. Knowing that their ultimate goal is to win a national championship, the players are ready to get the season started and one player knows they have the talent to shake up the conference. The Pirates played a scrimmage with the Savannah Storm club soccer team on Friday and won the game 6-1. 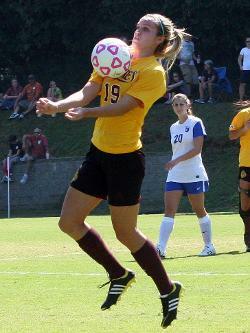 Freshman Jenny Allen pulled off the hat trick scoring three goals er route to the tune-up victory. Armstrong will host their first game of the regular season on Friday September 5th when they host Catawba at home at 3:30 pm.